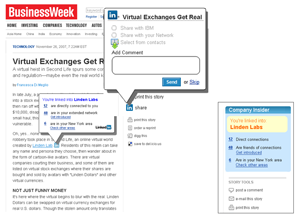 LinkedIn, the social network for professionals, is trying to establish itself as a better destination with a stronger presence on the web. As a better destination, LinkedIn would experience higher levels of user engagement and more page views, which in turn would translate into greater advertising revenue. With a stronger presence, the site would grab mind share away from rising competitor Facebook, which has already become a household name for many. A new homepage, with a focus on providing users with reasons to return more often, is under development and meant to turn LinkedIn into a better destination. A “beta” version of this homepage will go live for a subset of LinkedIn users this Monday. The three homepage components meant to entice users back to the site include on-site messaging, news articles from around the web, and “network updates” (i.e. a news feed). On-site messaging is not new but will now enjoy prime real estate on the homepage, with the inbox sitting on the top of everything else. The news feed, which will be given third greatest prominence, will display the network activity of people in your network. Most notable is a new feature, discovered by Erick last week, that will display headlines from around the web which may be of professional interest to you. 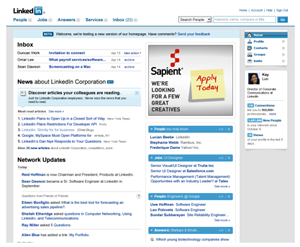 Unlike the early version of this system that Erick stumbled upon, the most recent iteration of LinkedIn’s news aggregator – the one featured on this beta homepage – will not require any manual training. It will rely on its own algorithms to automatically determine what you may be interested in reading, in part using the history of what other people in your network have read to make its selection (LinkedIn is not disclosing what service it actually uses to aggregate all the headlines in the first place). News articles will be filterable by topics such as: most read, company, competitors, and industry. More interesting to me is LinkedIn’s attempt to build a stronger presence on the web by providing an API, previously disclosed but until now without any real details available. There’s still not a lot of information, but the company has disclosed that it is actively working with select group of partners to develop applications with the new API. 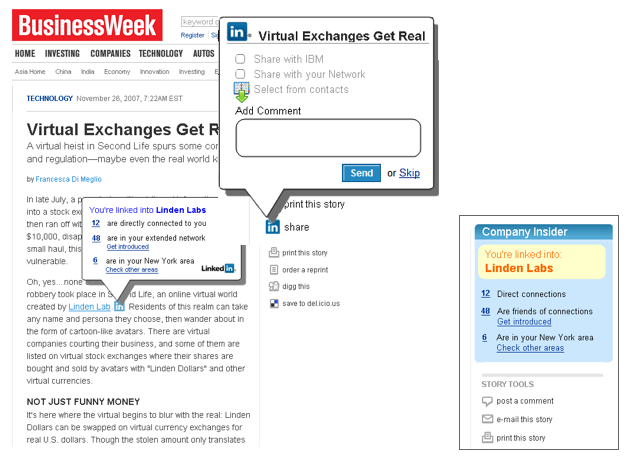 BusinessWeek, the only known partner, will implement a few features using LinkedIn’s API, as shown in the screenshot to the right. The API will basically allow BusinessWeek to draw from the information in users’ profiles and associate it with the content in its articles. One way to do this will be to display, via a popup, how many people in a company are directly connected to a user or in the extended network or geographical region of a user. LinkedIn hasn’t disclosed exactly when the API will be readily available but the company does say that the API will eventually be accessible to any and all developers sometime in the next year. The API will provide access to information in profiles, connections, search, network updates, and the “company insider” (its news article service).